Well better late than never as they say, Sunday's blog arrives on the unusual spot of Monday! The reason for the delay being that I simply ran out of time last night and thought it would be better to do something less rushed, even if it meant being a day late. As I'm now writing in the afternoon instead of the evening it does also give me the chance to step outside and describe what's going on. 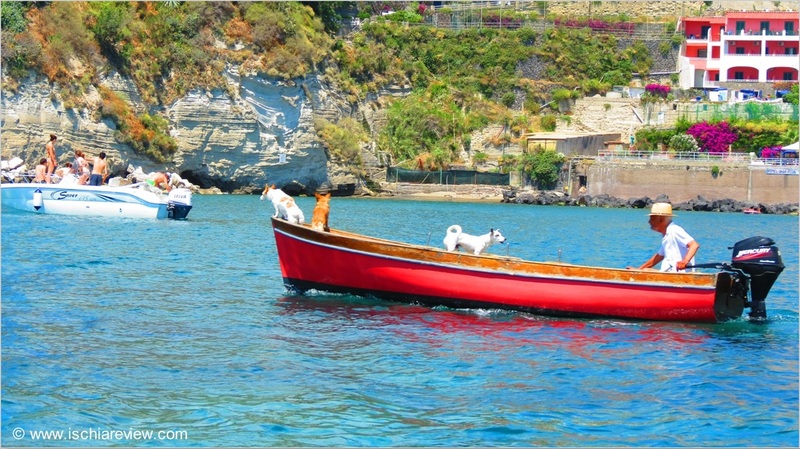 We've got a sunny but very windy day today here in Ischia which is bad news for anybody who is or was planning a boat trip today. Looking out into the bay there are huge white stallions galloping over the waves, making for slightly treacherous conditions for all but the most skilled sailors. With the wind up around 20 miles per hour (34 kph) it also feels much cooler today than it has over the last week, meaning we've all got that little bit extra energy to spare in the previously soporific afternoon period between 1:30 and 4:30 when most people are taking their siesta. For those of you craving a bit of sunshine and hotter temperatures fear not, the wind dies right down tomorrow and the forecasts for the rest of the week are very good with temperatures getting up to 33° Celcius (91° Fahrenheit) by Friday, hot enough for pretty much anybody I would suspect. As mentioned in last week's blog, the Ischia Film Festival is now well and truly upon us. The event centres around Castello Aragonese with all sorts of film-related activity including workshops, interviews but most importantly, film screenings. This year's event sees five different locations being used within the castle to screen five different films simultaneously. The castle makes for a stunning backdrop from which you can enjoy the films for free on a first come first served basis and there's a full list of films and timetables available at the official Ischia Film Festival website here. I'll be treating myself to one or several of those films this evening which I'm very much looking forward to and will of course be there with my trusty camera to report back on my findings. I've chosen today's photo because on one hand it really epitomized my week which was spent largely out on the water, and on the other hand because the three dogs looked like they were having such a marvellous time and made me chuckle. I was lucky enough to do two complete laps of the island last week by boat and would thoroughly recommend the experience to anybody who is coming to Ischia during the summer and is looking for some ways to have a fun day out. I really don't think you can beat the boat rentals to provide you with just that, I took out the Predator 570 which is a motorized dinghy with plenty of power and really provides you with an exhilarating experience as you get up around 40-50 knots and feel the boat bouncing off the waves beneath you. Anything above that and a land-lubber like me starts to get a bit nervous but even if you're just planning on a slow cruise around the island it makes for a really great day out. Anyway that's all from for today, apologies for the lateness and I'll be aiming to be back on track for next Sunday's blog. Don't hesitate to write in if you've got any questions and we'll be very happy to help you with some advice about Ischia. Have a great week (or 6 days anyway)!